Amidst poor earnings and a wrecked marriage, a portfolio manager is feeling the stress. Top Floor is a rather simple story. A character piece rather than anything high-concept, it ended up being one of our favorite shorts of SXSW 2013 due to its preternaturally confident direction and gorgeous cinematography. Taking place in the high stakes world of big-money asset management, the film opens with our main character defending his fund’s track record in the face of lower than expected earnings. Finance is a world of great characters and inherent drama, and it’s a shame that more films don’t take advantage. Our character is, in no uncertain terms, a liar. Perception is reality in this world however, so he struggles to maintain the facade of success—he bluffs the influential investor who is demanding his money back, and keeps up the charade at the swanky apartment of a friend and potential investor. Somewhere along the way things have gone south for our protagonist, but if he can keep the capitial flowing, he is convinced that he is one trade away from being back on top. In the meantime we see that his personal life has suffered. He lives in a swanky apartment, but it is woefully unfinished. His ex-wife hectors him every chance she gets, and he realizes that he isn’t being the father he would like to be to his young son. A weekend with his child allows a much needed reprieve, and yet threatens to burst the carefully maintained bubble he has crafted. 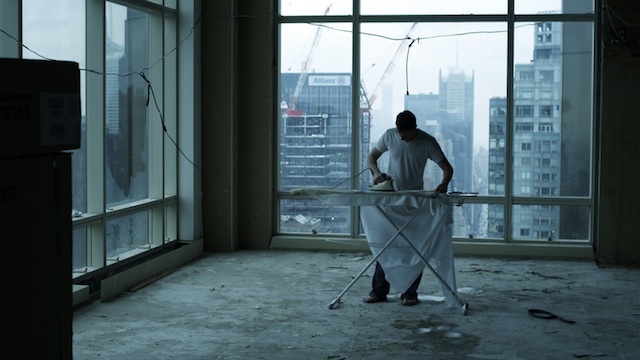 An MFA film at Columbia U, Top Floor is the latest in a very impressive series of films to come from the program. As an NYC school, it is somewhat in the shadow of the more famous film program at NYU Tisch, but it has carved out an impressive space for itself. More commercial than the classically indie films to come out of NYU, I feel as though the school’s output is a an interesting middle ground between USC’s decidedly Hollywood sensibilities and NYU’s auteur-driven productions. Top Floor certainly has traits, and production values, that could easily be compared to a mid-level studio drama. Director Aaron David DeFazio, working off a script from Producer Daniella Kahane, proves a knack for showing, not telling, and the central metaphor of the glamorous but unfinished apartment is more subtle than it appears when writing about it. Ultimately the film may frustrate a bit in the way it feels unfinished—what can you say happened in the film? But as a stylish introduction to a world and a skillful building of a character, it is certainly far more complete than many of the sci-fi proof of concept pieces that we feature. The final line, “this is where I want to be…right?”, is a pitch perfect encapsulation of the idea that DeFazio and Kahane want to present, and serves as a haunting outro that allows this subtle but wonderful piece of filmmaking to resonate long after the credits roll.